We design and execute murals in any style from Old World to contemporary. When finished with aging and atmosphere, these spectacular original works make a gorgeous, dramatic addition to any room or outdoor area. 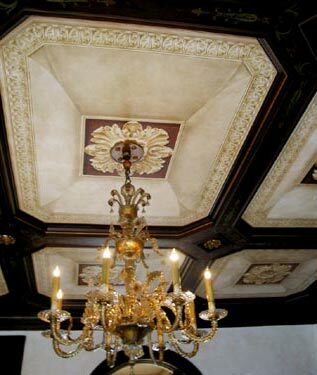 Our trompe l'oeil mouldings, niches, coffered ceilings, windows, tapestries and floor cloths will fool the eye, delighting you and your guests.